In this guide you will learn about all the different kinds of skywriting. The advantages and disadvantages of each type of skywriter. All methods involve writing your message across the sky for all to see. How Much does Skywriting Cost? Skywriting costs vary with the type of skywriting you choose and the Skywriter you employ. Banner Towing or Sky Signs are the cheapest form of Skywriting. SKY-ADS will do a Marriage Proposal anywhere on the Gold Coast for only $880. For business advertising flights start from as little as $1200. 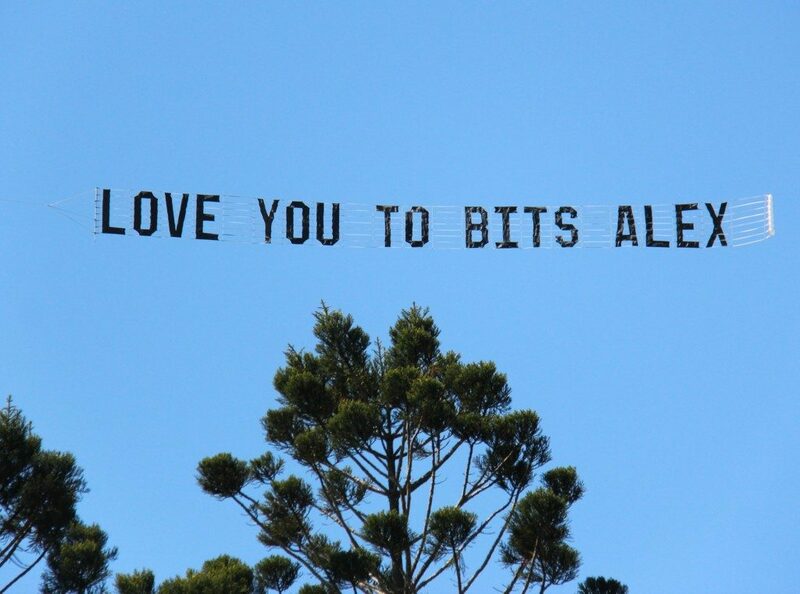 Combination displays and Aerial Billboards are the next cheapest form of skywriting. A one off investment for production of the Billboard is the only reason billboards are second. Otherwise, the actual flying time investment for exposing the sky display; is still $1200. Smoke Skywriting comes in next at around $6000 for 10 letters. Sky Typing follows because of the many aircraft and pilots required. To Date, this method has not been seen in Australia. Because of the cost we suspect. Lastly Helicopter Flags are the most expensive type of skywriting. The hectic cost of running a helicopter. Running a jet helicopter only increases the Cost. Although a jet helicopter can fly larger flag. Along with the initial production cost of the flag. Therefore, the prohibitive cost of this form of skywriting usually places it out of reach of most small to medium corporations. SKY-ADS would recommend investing in a slightly smaller Billboard. Which an aircraft can tow. Reinvesting the money saved into display airtime. What is the Best Value Skywriting? In SKY-ADS opinion the best value skywriting is the Combination Display! As any Marketing Manager would suggest. Repetition is most important to get results from any Advertising Campaign. Repetition – comes down to cost. Impact – which results in retention and therefore Consumer Action. Coverage – adding a huge new audience always helps a campaign. The Combination Display provides the best combination of these attributes to get results. Colourful Graphics plus a changing message demands attention. Creates action and therefore Sales. Being aircraft towed gets the coverage vs readability correct. Plus we cover the Huge Gold Coast Beach Market. Combination Displays – Best Value Skywriting! 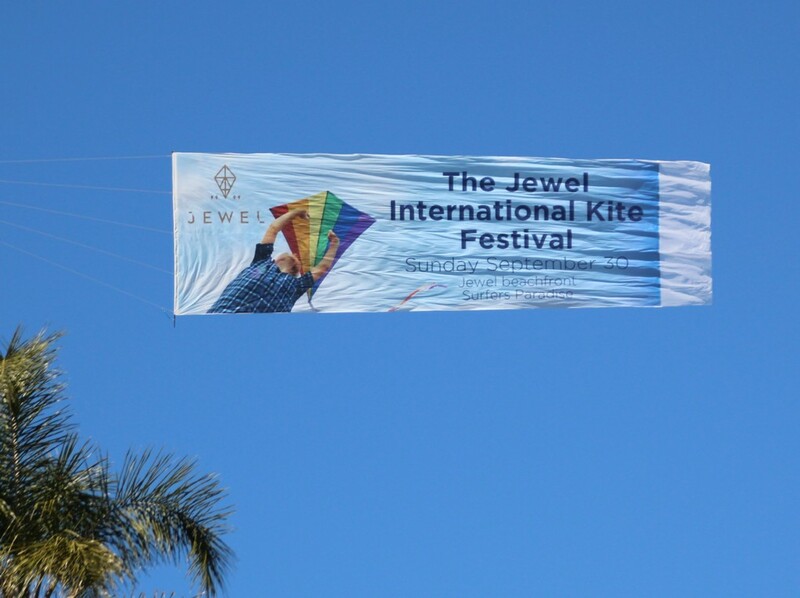 Following on from the pure Aerial Billboard is a slightly smaller billboard with the ability to attach Banner Letters behind. The resultant Combination results in the ultimate Aerial Display. One with big visual impact and flexibility to remessage after any flight. In addition, if the billboard section carries your famous Logo consequently the resulting aerial display will have instant recognition. Low Display Cost = Repetition. Being light aircraft towed. Combination displays are the same low investment to display as a Banner or Billboard. Therefore allowing for increasing the repetition of advertisement displays. This is especially true if replacing a Helicopter. A Combination Display could be flown on as many as 65 two hour flights covering the Gold Coast completely Twice. For the cost of 1 helicopters hour. Which might only get down to Burleigh Heads. If the wind is wrong and most of that time it will be reading backwards. Colourful Graphics plus the skywriter can change the letter message as often as required gives this form of skywriting more impact than any other. Aircraft towed displays are the most efficient form of skywriting! Achieving the best balance of areas covered vs the readability of the display. There is no point investing in giant displays, if it just sits in the one spot. Therefore covering only a few kilometers in an hour. On the other hand racing past before the audience can read your message is also unproductive. SKY-ADS aircraft travel between 55 and 60 knots. This speed most of all provides the ideal balance between readability and coverage area. 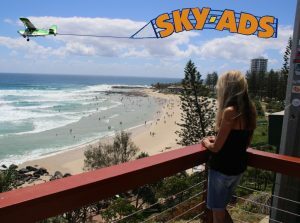 As a result SKY-ADS can cover all the Gold Coast beaches twice in a two hour skywriting flight. With exposure times sufficient that every beachgoer could have read the message as many as 10 times. Aircraft Banner Towing – absolute cheapest and most flexible skywriting! The second oldest form of Skywriting is towing a Banner behind an aircraft. Thereby writing your message across the sky! When a banner towing aircraft flies past it is compelling to look up. Aircraft towed banners are readable for many kilometers. Therefore a massive percentage of your audience takes notice of the message. Most importantly, this leads to effective audience message retention rates. Which above all creates action in the target audience. Banners care assembled from a stock of ready made letters. Which are reused over and over. Therefore next to no lead time is required for getting your campaign airborne. On the same hand changing the message is simple and easy creating flexibility. How are sky signs done? 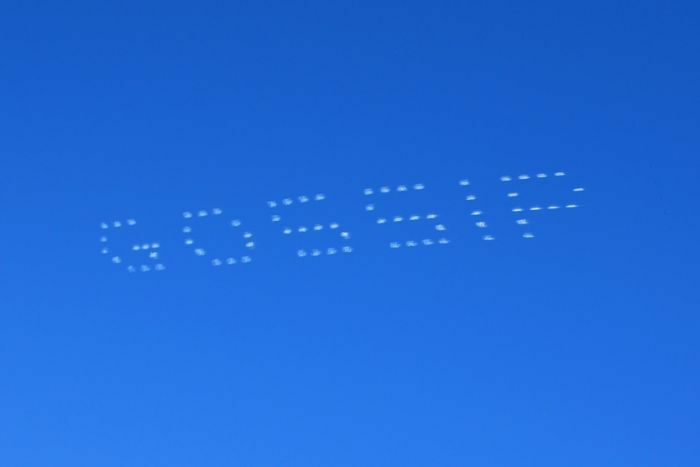 This skywriting technique involves the use of a small aircraft towing an array of letters behind. The letter form form the message. Because the letters induce large amounts of drag. The result is that a high performance aircraft is required. Similarly because drag increases with the square of speed. An aircraft which can operate at slow speeds is therefore required. But above all being towed by an aircraft results in the ideal speed for aerial display. SKY-ADS displays travel at between 50 and 60 knots. In short achieving the ideal balance between read time and coverage. Depending on the aircraft operated Large banners can be towed. SKY-ADS usual limit is 35 characters. But under certain conditions more can be carried . 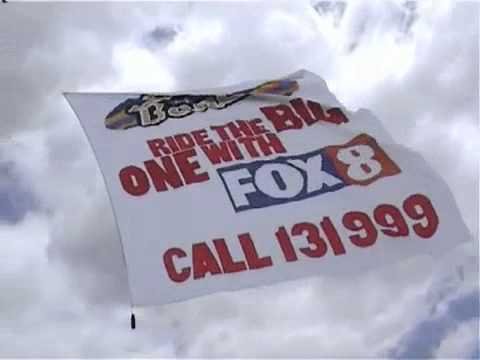 Aerial Billboards – similar to helicopter flags but better and less expensive in every way! Are a fairly recent improvement over the tradition Banner Towing Aircraft. Firstly this form of skywriting gives you a large blank canvas for your artwork. Importantly Billboards being full colour create great visual impact. Secondly using a relatively low cost aircraft to tow the Billboard makes them inexpensive to display. Aircraft towed billboards are wide screen format. Therefore many times longer than they are high. Up to 5 times! Finally the entire area of a SKY-ADS towed billboards is readable. In contrast helicopter flags often have the trailing corner sagged or folded over. Aircraft towed billboards have a idea travel speed therefore achieving the ideal balance between read time and coverage. This is similar to aircraft banner towing. This skywriting technique. Involves burning an oil in the exhaust of a single light aircraft. Which therefore forms a smoke trail behind the aircraft. The aircraft then maneuvers to spell out a message, one letter at a time. Consequently, this method depends largely on the skill of the pilot. And most importantly on very good weather conditions. That is to say the upper winds must be still and the sky perfectly clear. If on time performance is a requirement. This style of skywriting becomes impractical because of the limited number of suitable days. For example, a Marriage Proposal. Because the perfect conditions required to perform the manoveres required seldom occur on the day required. This form of sky display can only spell out a very limited in the numbers of letters. Therefore most smoke skywriters limit is around 10 letters per session. 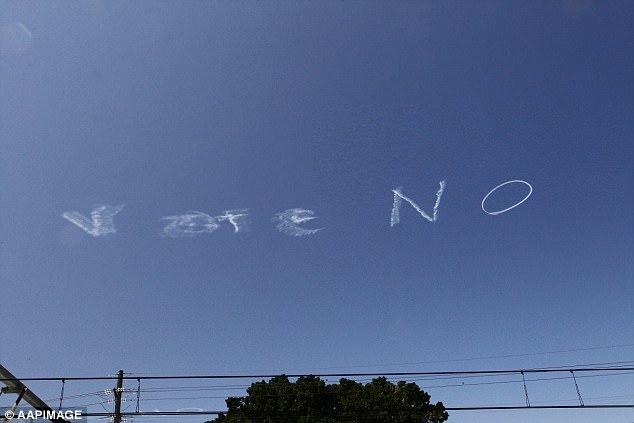 Another disadvantages to this form of skywriting is completing the message. The time taken to spell out each letters is considerable. Occasionally the first letter can collapse or drift away before the word is complete. Therefore the completed message can be unreadable. Is a very recent form of skywriting. Whereby 5 aircraft equipped with smoke generating equipment Fly in close formation. Each aircraft puffs a computer controlled smoke bot. This results in a Dot Matrix display thereby being Typed across the sky. This skywriting technique is certainly very effective. Further, it doesn’t suffer the limitations of a single smoke skywriter aircraft. Because the message is typed almost instantly. However sky typing is limited like any smoke skywriter to weather conditions which are rarely perfect. And therefore suffers issues of non-performance due weather. This form of skywriting involves the use of a Helicopter Sling Load capacity. A large flag made of lightweight sailcloth flys below the Helicopters cargo hook. A rope with a large wright attached on the end hangs below the helicopter. This holds the flag tight along its advancing edge. The Flag pulled straight by the forward speed of the helicopter. Similar to the way the breeze blows a flag up from its pole. However the trailing top corner struggles to be help aloft and droops. Consequently the readability of the flag suffers. In other words flag usually look rhombus in shape. In the same vein the low forward speed of the helicopter limits the coverage area. Importantly, the helicopter’s normal low speed of only 30 knots gets cut dramatically if a headwind is blowing. To the extent where the whole aerial display will be virtually stationary. This effect can ruin your coverage. You can wind up paying for a helicopter to go nowhere. Finally Being only a “square” shape dramatically restricts the text height. An important consideration when considering a Helicopter Flag is that even a small helicopter is extremely expensive to run.